Ships are currently still in beta and the finer details have not been worked out. Right now the in game gameplay is very different compared to what the future gameplay will be. Doesn't need to be large. Passive collectors over the course of a long period of time would gather a fairly decent amount of "free" fuel. Flying through the outer atmosphere of a Gas Giant, orbiting a star, or flying through nebulae would be great ways to quickly gather hydrogen without having to do anything but fly through. The same could be done for small amounts of antimatter. Since you wouldn't be touching your antimatter except for special circumstances you could have magnetic collectors around the ships that randomly grab onto stray antimatter particles and move them into the storage tank. Ways to do this would be what we already discussed. Flying in orbit around stars or planets would allow you to grab a few stray particles at a time and extended stays around large Jovian worlds would gather larger amounts. This would not be enough to run a ship off of or for prolonged use but every little bit of fuel you can get counts in the long run. Added: That Space Math site werdna linked gives wrong answers for this calculation. I think its formula is right, but has a decimal place error. Centripetal force is the real force, the one that the ring supplies to whomever/whatever is on its inner surface and keeps them undergoing uniform circular motion. Centrifugal force is the fictitious force which appears in the rotating frame of reference, "pushing" them outward from the center of rotation. Both terms are equally acceptable, it just depends how you want to describe the system. I think i have heard something about, that a ring need a special size, that the fore is consistent enough for the crew. A very small ring with a very high speed could cause problems. One of the reason the system can't be applied on smaller ships. But donno if the calculation there is correct. A (much smaller) Stanford Torus need only rotate once per minute for 1G. I am confirming schwarzwolf's hint that a torus with 1/day rotation rate must be very large if it is to have 1g surface acceleration, following the commentary in posts 74 and 75. Rotation speed has everything to do with size if it is expected to have a particular effective gravity. r=a/ω2. The inner part rotates once per day and creates artificial days/nights. 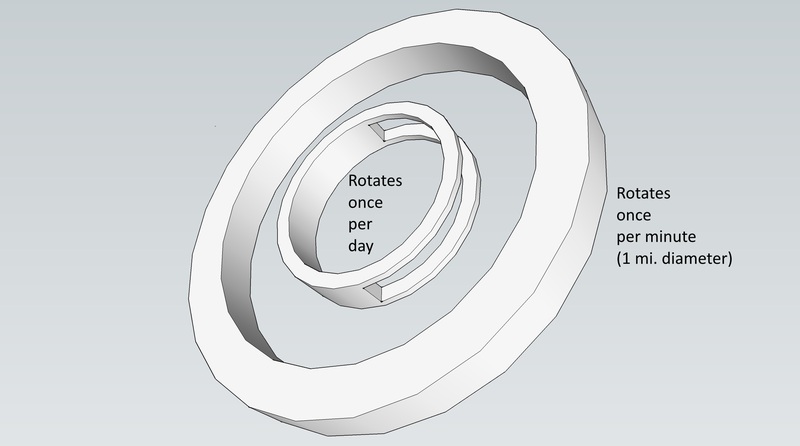 The outer part rotates once per minute and creates 1G "gravity." EDIT: This is assuming that we are discussing a Stanford Torus with mirrors which redirect light directly into the inner side of the ring. The inner part as seen in the diagram above selectively blocks off some of this light. EDIT 2: If it helps, think of the light source as being in the center. EDIT 3: Obviously, the diagram isn't to scale. Right, and the kinematics for this design are good. The confusion is that the size for 1/day and 1g acceleration commentary is tangential, since you don't need 1g on that inner ring. Yes, thats actually how i tought it aswell. the outer part is independent from the sun position and would rotate, depending on the size of the ring. Intresting would be still the minimal size, such a ring can have for simulating a good gravity without some side effects. For the inner part, yes it would rotate 1 times per day. My first idea was to take a mirror in the inner structure to shine through the windows of the ring and only using one solid ring. But yes, in a more radioactive area, it could be a problem. Two ring parts, who is closed and equipted with mirrors could be better. You could aswell project different images into the ring like stars, etc. Possible aswell have such good mirrors, that it looks more natural. This is an image from the original design study showing a cross section of the mirrors. Just to be clear, the model I made does not have that inner part in the diagram from my last post (which would selectively block off light for fake nights/days). An idea for a set of stations I've been thinking about would work in conjunction with orbital stations that have storage and processing facilities. Flying through the upper atmosphere, similar to an airplane so no rotating torus required. You would have a station split into 3 sections, 2 lower sections are the industrial sections whose sole purpose is to gather deuterium/H3/hydrogen for fuel, and would have minimal human crews. The top or central part would be residential, managing, and storage. This is where people would be staying and living for the most part and operating the overall station from. These stations would be completely self sufficient. Since the stations would be in a stable flight and not in free fall occupants would be able to walk around fairly comfortably in stations doing this around the gas giants in our solar system. Yes, if its always rotated to the sun, it could work. Yes, such stations could be aswell nice as Hydrogen refuelling and extraction stations. 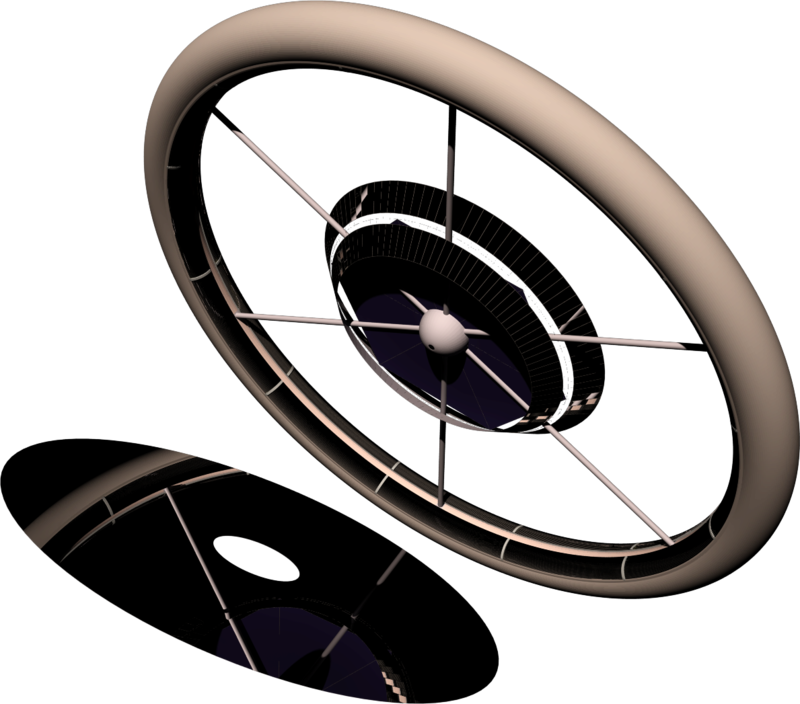 Possible some device could be added to grab fuel from the gasgigants while orbiting. The ring stations would be good for smaller planets, like rocky planets. 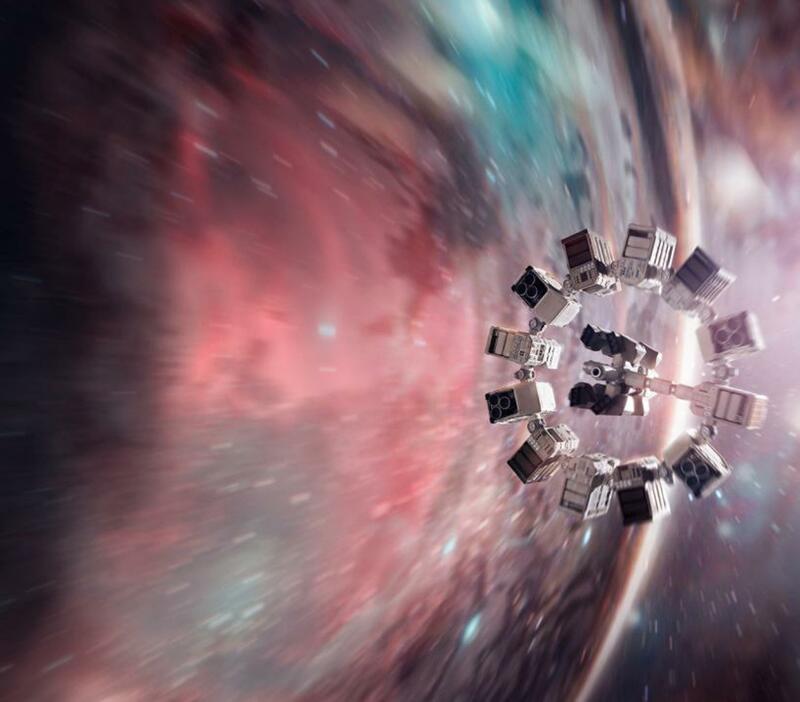 Maybe a simulation of wormholes could be quite interesting to implement. For example, you use your camera and go straight toward it, and jump into another place in another random galaxy. The only problem is that nobody knows if wormholes exist. Yeah, maybe. But if you ask me, I wouldn't want it to be essential and omnipresent but optional. Wouldn't feel good to have a wormhole inside every single (supermassive) black hole, since it would not be very accurate to have them, realism-wise. This discussion on wormholes could go in any number of threads but since it could pertain to future gameplay I have moved it to the spaceflight physics discussion thread. Been discussed many times and the answer is always no. Maybe in some mod or some far off game made in the engine, but by default and for the foreseeable future there won't be wormholes. Wormholes interrupt the core gameplay feature of free exploration. I've thought about how one could introduce a gameplay mechanic of sorts into a future version of SE using black holes and white holes. Perhaps one could fly into a black hole inside a sort of bubble of space similar to a warp field, force open the singularity which should be a ring of sorts(Ring Singularity), and burst out somewhere else in the universe entirely. You would have to skew the physics a bit to avoid time travel, other universe travel, and the likely chance of popping out in intergalactic space. It would add a nice randomization for exploration as the player would randomly come out somewhere else with no idea where they are. The player at this point could be a few hundred or a few billion light years away.